Atmospheric Carbon-14 and Beryllium-10 are cosmogenic nuclides created by high-energy phenomena such as cosmic rays and nuclear explosions with other contributions probably coming from lightning and the burning up of meteoric material. According to Settled Science the cosmic ray flux is “anticorrelated” with “solar activity” and that [historically] the levels of atmospheric Carbon-14 and Beryllium-10 reflect “solar activity”. As a consequence, the cosmic ray flux in the inner solar system is anticorrelated with the overall level of solar activity. Some high-energy cosmic rays entering Earth’s atmosphere collide hard enough with molecular atmospheric constituents to cause occasionally nuclear spallation reactions. Fission products include radionuclides such as 14C and 10Be that settle on the Earth’s surface. Their concentration can be measured in ice cores, allowing a reconstruction of solar activity levels into the distant past. This theoretical relationship between Carbon-14 and “solar activity” is most probably the underlying rationale behind the fine tuning of the radiocarbon calibration process to create a peak in Carbon-14 values during the Maunder Minimum [1645 – 1715 CE] that is broadly consistent with the Beryllium-10 values from the Greenland Dye-3 ice core. Although this deference to the glaciologists and their Beryllium-10 Ice Core Chronologies is very touching the independent observer should establish whether this deference is justified. This is where the Settled Science becomes murky. The primary issue is that the rapid downward oscillations in the Beryllium-10 Chronology from the Dye-3 Ice Core don’t emulate the observed atmospheric Carbon-14 Decay Curve. As of 1998 the only long record available for 10Be is from Dye 3 1979. 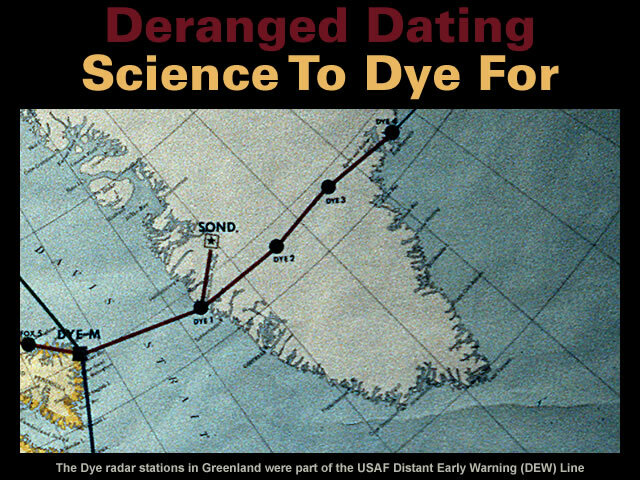 Questions were raised whether all parts of the Dye 3 1979 record reflect the sun activity or are affected by climatic and/or ice dynamics. Wikipedia obliquely addresses the issue by noting Beryllium-10 is preferentially removed from the atmosphere because it dissolves in rainwater. Because beryllium tends to exist in solutions below about pH 5.5 (and rainwater above many industrialized areas can have a pH less than 5), it will dissolve and be transported to the Earth’s surface via rainwater. As the precipitation quickly becomes more alkaline, beryllium drops out of solution. Cosmogenic 10Be thereby accumulates at the soil surface, where its relatively long half-life (1.387 million years) permits a long residence time before decaying to 10B. However, snow is the predominant form of precipitation at Dye 3 in Greenland. This specifically implies the Carbon-14 and Beryllium-10 content of the snow falling at Dye 3 is primarily determined by low temperature isotope fractionation. Equilibrium isotope fractionation is the partial separation of isotopes between two or more substances in chemical equilibrium. Equilibrium fractionation is strongest at low temperatures, and (along with kinetic isotope effects) forms the basis of the most widely used isotopic paleothermometers (or climate proxies): D/H and 18O/16O records from ice cores, and 18O/16O records from calcium carbonate. In general, the light elements (especially hydrogen, boron, carbon, nitrogen, oxygen and sulfur) are most susceptible to fractionation, and their isotopes tend to be separated to a greater degree than heavier elements. That’s not to say melt water can’t significantly influence the isotopic composition of the ice. Summer melting is usually the rule at Dye 3, and there is occasional melting even in north Greenland. All of these meltings disturb the clarity of the annual record to some degree. “An exceptionally warm spell can produce features which extend downwards by percolation, along isolated channels, into the snow of several previous years. This can happen in regions which generally have little or no melting at the snow surface as exemplified during mid July 1954 in north-west Greenland4. Such an event could lead to the conclusion that two or three successive years had abnormally warm summers, whereas all the icing formed during a single period which lasted for several days. The location where melt features will have the greatest climactic significance is high in the percolation facies where summer melting is common but deep percolation is minimal4. These summer melt problems are compounded by rapid ice flow, thinning layers and diffusion. As the drill site of Dye 3 receives more than twice as much accumulation as central Greenland, the annual layers are well resolved and relatively thick in the upper parts, making the core ideal for dating the most recent millennia. But, the high accumulation rate has resulted in relatively rapid ice flow (flow-induced layer thinning and diffusion of isotopes), Dye 3 1979 cannot be used for annual layer counting much more than 8 kyr back in time. Therefore, overall, there are numerous indications that the Beryllium-10 Chronology from the Dye-3 Ice Core is neither accurate nor meaningful as a measure of “solar activity”. Gallery | This entry was posted in Atmospheric Science, Cosmic Rays, Dendrochronology, Deranged Dating, Glaciology, Greenland, History, Maunder Minimum, Radiocarbon Dating, Solar System, Water. Bookmark the permalink.